It’s hard to believe that the original Valkyria Chronicles is 10 years old this year – yet, here we are in 2018 with a fresh entry in the series that helps to invigorate a franchise that has been hobbling along for the last few years. Valkyria Chronicles 4 is a tactical role-playing game with elements of a 3rd person shooter/action title. You control the recently-promoted Claude Wallace and a rag-tag group of militia-members known as “Squad E” as they go to war agains the autocratic Eastern Imperial Alliance. During the course of your conflict, you will enlist additional troops, teach them new techniques and skills, develop new weaponry, and overall do your best to raise hell for the Empire as you undertake a bold and dangerous mission to capture the capital known as “Operation Northern Cross”. Fans of the series, and particularly of the initial entry in the franchise, will notice a lot of similarities in the plot. That’s not to say it’s a bad thing – young people spurred to action by tragedy during war and taking up arms is a perfectly believable trope. Instead, it places the focus on their interpersonal relationships, which are developed well throughout Valkyria Chronicles 4. The “mess hall” system even allows you to develop new orders by engaging with other members of your squad. This unexplored chapter of the broader conflict definitely helps to expand the world of Valkyria Chronicles, and also opens the door for possible follow-up games the re-examine the conflict from additional angles. The shining beacon on a hill when it comes to Valkyria Chronicles 4 is its return to the stellar tactical combat that made the original so fun. In battle, you start out with a birds-eye view of the field, and a certain number of Command Points, or CP. By spending CP you can move units, attack, call in reinforcements and give orders. Among your unit there are 6 distinct classes: scout, sniper, grenadier, lancer, engineer and assault. Each class has its own strengths. Assault soldiers can do a number on enemy soldiers with powerful machine guns. Scouts can cover an impressive amount of ground in a single turn. Grenadiers (with the assistance of other units) can target and take out enemies from long distances. Engineers can heal personnel and repair tanks. Snipers like grenadiers can pick off enemies from a distance, but with much more control. Lancers carry serious firepower in order to dispose of enemy tanks. By mixing and matching the different class types, you can rise to the challenge of conflict after conflict. Early battles will be fairly straightforward, with enemies that don’t necessarily capitalize on your mistakes. As the game progresses, however, your bases are pursued more aggressively, reinforcements called in and advanced tactics utilized to keep you on your toes. Luckily, you have the opportunity to strengthen your units with field training and research. After each major conflict you’re awarded experience (XP) and DCT, which is the currency of your faction. With XP, you can increase the capabilities of the various classes – improving their damage, health, range, and other key stats. By investing DCT you can develop new weapons for your soldiers, or upgrade your tank. As a fan of power-leveling myself, you’ll be glad to know that you can re-visit previous battles and undertake “skirmishes” to earn bonus XP and DCT to get your soldiers where they need to be for the next conflict. When it comes to the combat system, there is an added feature to the combat called the “Brave” system. When certain units near death, they can utilize a special technique – choosing to either “Rise Up” or “Entrust”. By using “Rise Up”, you become invulnerable to damage and get an extra turn to deal some damage to the enemy before you collapse. If you choose to “Entrust”, you’ll power up a nearby ally and restore one command point for use. 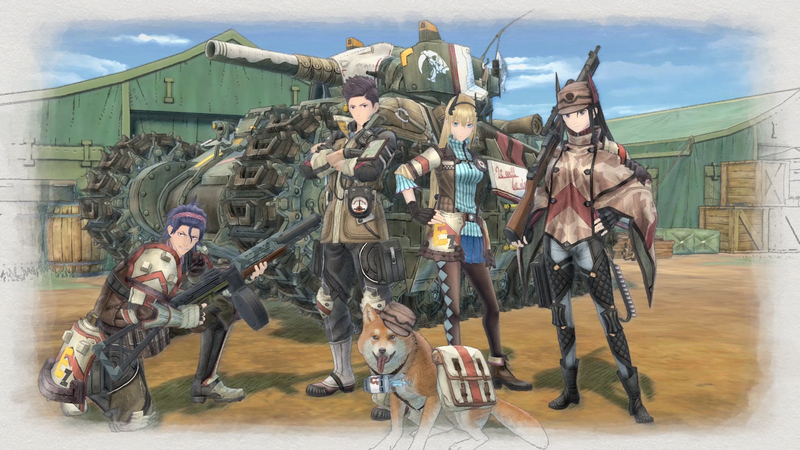 No joke – I love Valkyria Chronicles combat. Like any good combat system, it’s simple enough to pick up, but requires a lot of time and patience to master. The switch between unit selection and the 3rd person “action mode” is seamless, and adds a layer of depth that you don’t find in other strategy titles like the Disgaea series (don’t get me wrong, Disgaea is still my SRPG bae). Overall, I have really enjoyed my time with Valkyria Chronicles 4 so far. The satisfaction of lining up that perfect sniper headshot. Your lancer single-handedly taking out an enemy tank. Your scouts rushing ahead to deliver some sorely needed healing for an ally on the front lines. The gameplay is executed in such a way that each skirmish, each battle has you eager to dive back into the fight again to try and discover a more efficient method of capturing the enemy base, or tackling a challenging enemy. With an engaging plot, unique visuals, entertaining characters and rock-solid gameplay, Valkyria Chronicles 4 would be a great addition for any fan of tactical RPGs. Its only misfortune is being released so soon after Spider Man and Dragon Quest XI. With Red Dead Redemption 2 on the horizon, it’s going to be an expensive end of the year for gamers…but if you’ve got the money to spare, Valkyria Chronicles 4 is absolutely worth it.